Los Angeles, Feb 25 (IANS) US First Lady Michelle Obama announced Ben Affleck’s directorial venture "Argo" as the best film at the 85th Academy Awards here Sunday night. Michelle Obama introduced the nominations and the winner via a video conference from White House. The team of "Argo" – co-producers Grant Heslov, Ben Affleck and George Clooney – collected the trophy. 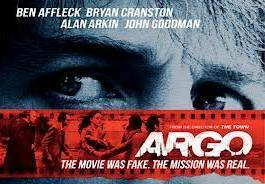 "Argo", set in the 1970s, talks about CIA ‘exfiltration’ specialist Tony Mendez (Affleck), who concocts a risky plan to free six Americans from Iran. It was among nine films vying in the category. Others were "Amour", "Beasts of the Southern Wild", "Django Unchained", "Les Miserables", "Life of Pi", "Lincoln", "Silver Linings Playbook" and "Zero Dark Thirty".